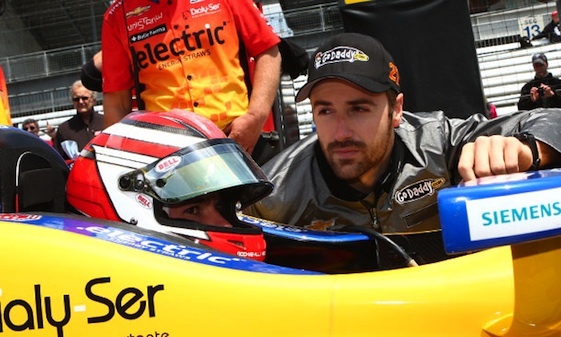 Rookie driver Carlos Munoz gets last minutes tips from Andretti Autosport teammate James Hinchcliffe at Indy on Saturday. Native son Ed Carpenter topped the speed chart on Opening Day at Indianapolis Motor Speedway, where his second-year IZOD IndyCar Series team is looking to bolster its history in the 97th running of the Indianapolis 500 on May 26. Carpenter, winner of the most recent IndyCar Series race on a superspeedway, posted a hot lap of 40.7296- seconds/220.970 mph Saturday around the 2.5-mile oval. Carpenter recorded 21 laps in the No. 20 Fuzzy’s Ultra Premium Vodka Dallara/Chevrolet under cloudy conditions and an ambient temperature of 51 degrees (66-degree track temp)when the six-hour session started at noon. Josef Newgarden, driver of the No. 21T Century 21 Dallara/Honda for Sarah Fisher Hartman Racing, was second-fast (220.920 mph/40.7387-seconds) on 59 laps. And rookie Carlos Munoz cranked out a best lap of 220.720 mph in the No. 26 Unistraw Dallara/Chevy fielded by Andretti Autosport during the waning minutes of practice. Charlie Kimball was fourth (220.633 mph/40.7917-seconds) in the No. 83 Novo Nordisk Chip Ganassi Racing Dallara/Honda, while 2011 Indy 500 pole-sitter Alex Tagliani kicked off practice fifth overall at 220.248 mph in the No. 98 Barracuda Racing Dallara/Honda fielded by Bryan Herta Autosport with Curb-Agajanian. Meanwhile, three-time Indy 500 winners Dario Franchitti and Helio Castroneves shook down their respective entries. Franchitti, the defending race champion, posted laps in his primary and No. 10T Target Chip Ganassi Racing Dallara/Hondas. Castroneves started his day in teammate AJ Allmendinger’s No. 2 IZOD Dallara/Chevrolet before lapping in his No. 3 Shell V-Power/Pennzoil Ultra Team Penske Dallara/Chevy. Carpenter became the lone IndyCar Series owner/driver at the end of the 2011 season, when he competed in 10 events for Sarah Fisher Racing and earned his first career victory on the 1.5-mile Kentucky Speedway. Carpenter’s fledgling team struggled throughout the 2012 campaign en route to an 18th-place point finish. The highlight was a victory in the season-ender at the 2-mile Auto Club Speedway in Fontana, Calif., on Sept. 15 _ the most recent IndyCar Series race contested on an oval. The first four races of 2013 have been conducted on either temporary street or natural terrain road-courses. Carpenter qualified 28th and finished 21st at IMS last May, finishing a lap down to Franchitti. “To be honest, when I think back to the last month of May, we had a good race, and a good car in the race,” said Carpenter, a 32-year-old native and resident of Indianapolis. “But really, I have bad memories from last May because we really struggled a lot. We came in unprepared, and we were lucky to get it sorted out by race day and have a chance to have a good finish. But even then, we still didn’t get a good finish. Carpenter began his IndyCar career with PDM Racing in 2003 after honing his oval-track skills in the U.S. Auto Club’s National Midget, Sprint Car and Silver Crown series. The 2013 season has been an anomaly, in that traditional powerhouses Penske Racing and Target Chip Ganassi Racing have failed to win. The last time Ganassi Racing and Team Penske both entered the Indianapolis 500 without a victory in the preceding races of the season was 1991. Andretti Autosport has won three of the first four races this season courtesy of James Hinchcliffe (Streets of St. Petersburg, Fla., and Sao Paulo, Brazil) and reigning series champion Ryan Hunter-Reay (Barber Motorsports Park). Takuma Sato (Streets of Long Beach) posted his breakthrough series win for A.J. Foyt Racing. So heading into the Month of May, why not Ed Carpenter at IMS? “I felt like we were going to be strong coming in just because we’ve learned a lot since we were here last year, and the team’s worked really hard,” said Carpenter, who graduated with a marketing degree from Butler University in Indianapolis in 2003. “You always have confidence when you win races. It was good to finish last year with a win; it did a lot for the team. Gave the whole team motivation to keep pushing over the offseason. Hopefully we can continue having a good month, and be there when it counts. Three first-year Indy 500 entrants needed only 90 minutes to complete the three required phases of the Rookie Orientation Program. “We really economized,” Tristan Vautier joked. Vautier, driver of the No. 55 Schmidt Peterson Motorsports Dallara/Honda, joined AJ Allmendinger of Team Penske and Carlos Munoz of Andretti Autosport in breezing through the session that split full-field practice. They were cleared to join veterans for practice building up to Pole Day qualifying on May 18. The Rookie Orientation Program is designed to provide first-year drivers an opportunity to get acquainted with the racetrack. The three speed phases, set by sanctioning body INDYCAR based upon the weather and track conditions, include 10 laps at 200-205 mph, 15 laps at 205-209 mph and 15 laps at 210 mph-plus. INDYCAR driver stewards Arie Luyendyk, a two-time Indy 500 champion, and Johnny Unser also monitor car control, placement and a consistent driving pattern. The program has proven to be an invaluable asset, even to individuals who previously have competed on the racetrack. Additionally, Conor Daly is expected to begin the ROP process Monday in the No. 41 ABC Supply Dallara/Honda for A.J. Foyt Racing. Daly had weekend racing commitments in Barcelona, Spain, where he finished third Saturday in the first of two GP3 races. Kurt Busch, the 2004 NASCAR Sprint Cup Series champion, completed ROP on Thursday in an Andretti Autosport Dallara/Chevy. Busch, who drives for Front Row Motorsports in NASCAR, is not assigned to a car this month. Three-time Indy 500 winner Johnny Rutherford turned laps in the 2014 Corvette Stingray Indianapolis 500 Pace Car Saturday. Rutherford, who serves as pace car driver at all IndyCar Series events, will be inducted into the USAC Hall of Fame during ceremonies at nearby Lucas Oil Raceway next Saturday. Fifteen drivers were on-track and turned 480 laps Saturday and for the month. AJ Allmendinger recorded 91 laps, including Rookie Orientation Program, most of any driver. There were four cautions for a total of 53 minutes. Practice is scheduled to continue Sunday from noon-6 p.m.